I've always liked Caesar Salad but have been put off in making it because of the effort and length of time to make the dressing. 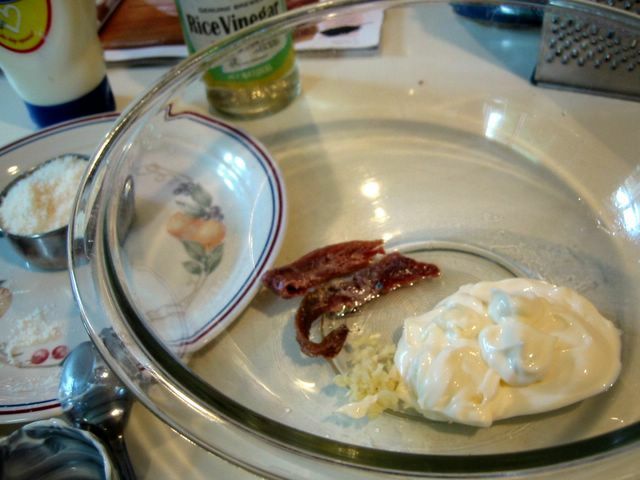 You are in effect making a mayonnaise with all that whipping of eggs and vinegar. Plus the thought of salmonella in the fresh egg makes me reluctant to serve it on the family dinner table. So there you have it - all my excuses. 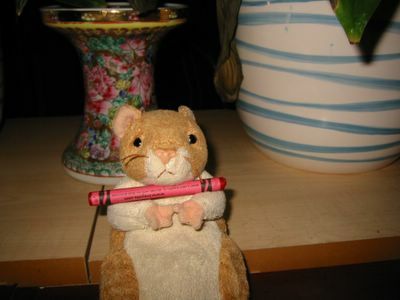 ;) Whether thru health concern, lack of time or just plain laziness I've thought of enough in not doing this from scratch. 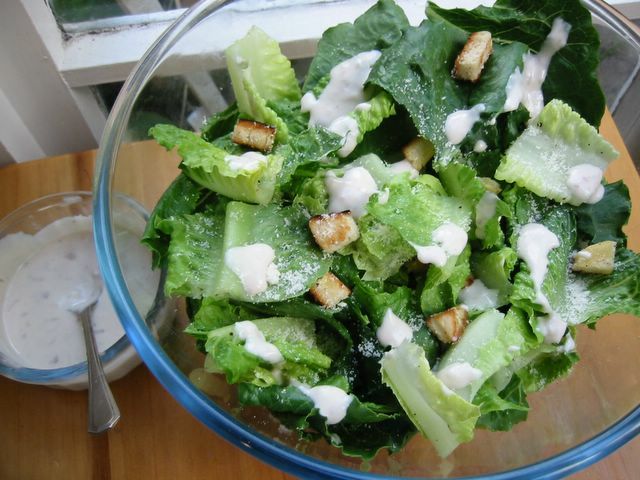 So you could just imagine how long we've suffered through store-bought Caesar Salad with ready-made croutons and its creamy sauce in a plastic packet [*over-acting mode on*]. Now I think I've found our savior of a recipe. This one that I found in last month's BBC GoodFood magazine is simple but sophisticated enough for my taste. (I know, I know, my taste can be pedestrian. LOL!) Kinda like in between the store-bought ones and the fancy-schmaltzy all-fresh-ingredients salad in upscale restaurants. The pain of making the mayonnaise is taken away with the use of ready made ones. It even got anchovies and hand-made croutons, wooo! Get a load of that. Though one thing I noticed is that the taste of a whole garlic can be too strong for others. If that is the case, the best way is to just give it a hint of the flavour by rubbing a cut garlic clove in the bowl and whatever utensil you'll use for whisking. 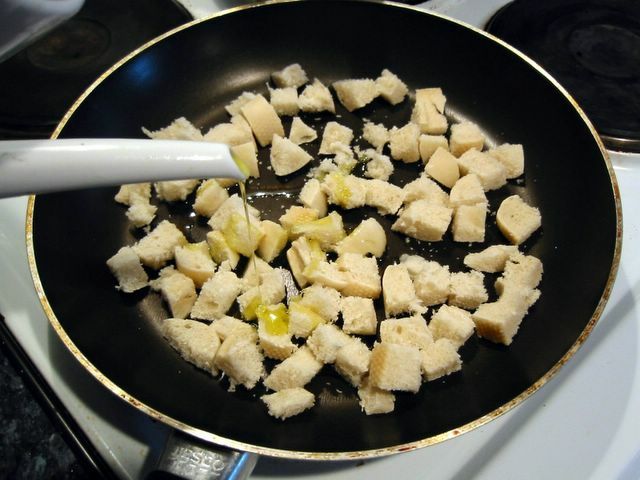 Put the diced bread in a non-stick pan. Drizzle the olive oil on it and some salt, making sure that the bread has absorbed all of the oil. Fry on medium heat. Turn the bread pieces from time to time. Cook until golden brown. Preheat oven to 200C/fan 180C/400F. Place bread pieces onto a baking tray. Drizzle the oil and some salt making sure that bread absorbed the oil. Bake for about 10 minutes or until golden brown, turning then halfway through. In a bowl, mash the anchovies well. Add in the garlic (if using), mayonnaise, and vinegar. Whisk to combine well. Stir in the grated parmesan. It should have the consistency of yoghurt. If it's too thick, whisk in some warm water a little at a time. Just before serving, put in a bowl the lettuce, half of the chicken (if using), and half of the croutons, and drizzle most of the dressing. Toss to mix. Scatter on top the rest of the croutons and chicken. Drizzle the rest of the dressing. Serve immediately. 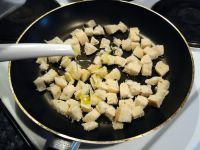 *Note: If a whole garlic in the dressing is too strong, you can just add in a hint of garlicky taste by cutting a whole garlic in half and then rubbing the inside of the bowl and the whisking utensil (fork or small whisk) to be used for making the dressing. *Variations: Instead of chicken, you can put in crumbled crispy fried bacon or flaked canned tuna.